Born in Canada, living in London, made in Italy. Dsquared2 has made it to my list of favourite designer’s at Milan Fashion week. Layered Goth-icky chains, skinny ties, black pants, leathers, white shirts, accented with pinks and denim, but most importantly the leopard prints. Their cool edgy biker club like designs were ravishing with their many awesomely-cool embellishments, and their motorbike boots and that one leopard printed shoes. It’s no surprise that Dean and Dan Caten showed one of the best shows on the catwalk this year. 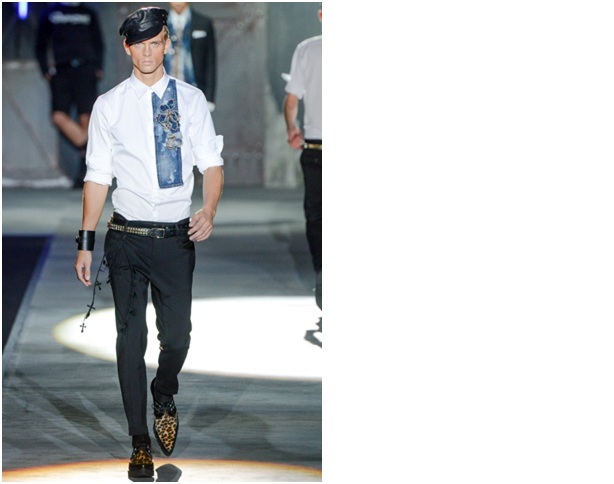 Now here are my top favourite Dsquared2 looks of the spring menswear 2013 fashion show.